The economic and trade ministers of the BRICS nations will gather in mid-July in Brazil for a summit on commercial expansion. During the meeting, Moscow and Brasilia are due to sign a joint plan of economic and trade cooperation for 2014-2015. For one day on July 14, the Brazilian city of Fortaleza is to be the center of discussions of participating BRICS country economic programs. The meeting’s agenda will have a full slate, as the Ministry of Economic Development of Russia told RBTH. In particular, officials from BRICS nations (Brazil, Russia, India, China and South Africa) will discuss ways to expand trade within the bloc through value-added goods. The joint declaration, which was initiated by South Africa, is almost completed, a source in the Ministry of Economic Development told RBTH. The meeting will also serve as a forum for consideration of various proposals and initiatives by Russia, China and South Africa to further expand trade and investment cooperation. In addition, officials will discuss a project on a BRICS Economic Cooperation Strategy, which is a major initiative for Russia. 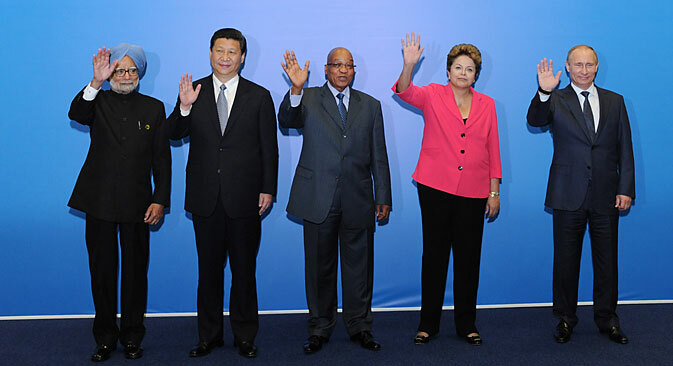 Moscow launched the development of the project after the BRICS Summit in Durban in March 2013. Developers have analyzed the national strategies of the individual participating countries and, out of necessity, have taken into account the most complementary economies while preparing for the project, using their strengths to increase the competitiveness of the bloc of participating countries, said a source in the Ministry. Now the project is under negotiation. The Ministry of Economic Development expects the final approval of the Strategy by leaders of the participating countries to take place at a summit in Ufa, in 2015, under the Russian BRICS presidency. “Priority areas of cooperation between the participating countries, which are enshrined in the Strategy project, are trade and investment, manufacturing and mining, energy, transport and logistics, agriculture, innovation, and technology exchange,” one source told RBTH. The source did not disclose other details of the document, warning only that the emergence of collective labeling under the title “Made in BRICS” has not yet been a topic of discussion. “The circulation of goods under a single label implies a common market in the classical sense with all the associated attributes and institutional framework. BRICS is a relatively young union, and we still have quite a few steps left before realizing the serious potential of our cooperation,” he said. In addition, the ministerial meeting will discuss the development of cooperation in the field of electronic commerce. The purpose of this initiative, as explained by the department, is the creation of a barrier-free environment for the development of e-commerce between partner countries. Those analysts polled by RBTH, however, were skeptical that the development of such an e-commerce project could significantly affect the performance of turnover. Trade in consumer goods over the internet is already under way (for example, Chinese online shops actively sell their goods in Russia). “E-commerce began to flourish only at the beginning of the 21st century. Currently, however, it only accounts for a maximum of 5 percent of trade, so there is no reason to suspect that the development of e-commerce will seriously affect trade between BRICS countries,” said Roman Andreyeshchev, Associate Professor at the Department of Foreign Area Studies and the RANEPA International Cooperation. According to a Ministry of Economic Development source close to RBTH, discussions are planned at a ministerial meeting in China for a Framework Agreement to strengthen economic cooperation and a plan of action for trade and investment. South Africa proposes considering the outcome of a seminar on investment agreements held during the year of its presidency. Following the meeting, a joint communiqué will be issued. It can be assumed that during the visit of the Russian delegation to Brazil issues of bilateral cooperation will be raised. In particular, on the sidelines of the meeting, ministers are expected to sign an action plan for the development of trade and economic cooperation between Russia and Brazil in 2014-2015. The document provides for joint steps for cooperating within the framework of mutually advantageous projects, strengthening interregional cooperation and the exchange of business missions, and the participation of Russian and Brazilian businessmen in international fairs and exhibitions, as well as in other business ventures. As the source explained to RBTH, the participation of Russian companies in conjunction with Brazilian partners in the construction of large projects in Brazil in the energy field could become a driving force for the consolidation and strengthening of the entire range of bilateral relations. This collaboration would increase the share of high-tech products and products with high added value in the structure of Russian trade. According to the results of 2013, the volume of trade between Russia and BRICS countries grew by 0.5 percent, to $105.4 billion, about 12 percent of Russia’s total foreign trade. From January-April 2014, the volume of trade reached $33.5 billion, offering hope that this year will not see a reduction in overall numbers. BRICS participants have made significant progress in the formation of joint institutions, which in the future should strengthen cooperation. Examples include the formation of a developmental bank and a pool of foreign exchange reserves. An initiative is currently being developed to create a reinsurance pool.